This 3-piece Sherry Kline Cheetah towel set features an embellished cheetah skin design. 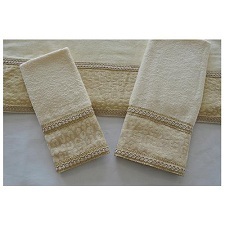 These velour towels showcase a wheat/natural color palette and are finished with gimp detailing. Dimensions The digital images we display have the most accurate color possible. However, due to differences in computer monitors, we cannot be responsible for variations in color between the actual product and your screen.